I have a B2 visa, and the admission stamp says I must leave by October 8th, so I booked my flight home for October 7th at 9PM. Just in case something happens and my flight is delayed, does anyone know if it's possible to just book a random flight at LAX out of the country, or even a bus out of the country? I'm thinking, if I overstay my visa I'm obviously in a lot of trouble, so I would want to have a backup plan to get out of the country as soon as possible if my flight was delayed. Has anyone heard of, or experienced, anything like this? Nothing happens if your USA visa expires while you are still in the country. Unlike most countries, the USA visa expiration is not related to how long you can stay in the country. Instead, the visa expiration indicates the last day you can enter the USA. Even if you had entered on the visa expiration day, you could receive a normal six months admission. The date you must depart the USA is the date stamped into your passport when you entered the USA. If you cannot find the stamp or want to confirm the date, you can look at your online I-94 record, which should also show the date you must depart. I got suspicious and went to read your previous questions. They revealed that you have entered the US once before and were admitted until October 8, 2018, and that you got an admission stamp which was stamped partly across your visa. This is just a regular admission stamp for your visit. 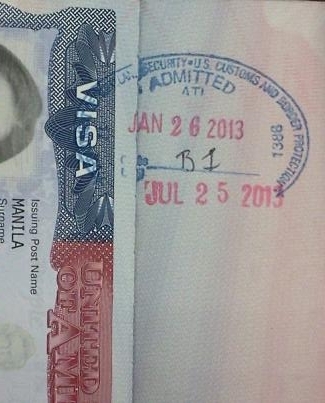 On your first visit using a visa, CBP will place the admission stamp so that it is partly on the visa. This does not cause the visa to expire. The visa expiration date remains as it was originally printed. It simply means your initial trip to the USA must end by October 8. But you already left the USA, so it is no longer relevant. Here we see that this visitor's first visit to the US using this visa was in January 26, 2013, and she was admitted unitl July 25, 2013. But the visa remains valid for multiple entries and several more years. Admission stamps you get for future visits will be placed elsewhere in your passport. Not the answer you're looking for? Browse other questions tagged visas usa lax or ask your own question. Can I go out of LA airport during a layover without a visa? Will I overstay my Visa Waiver if I fly from Mexico to catch a flight in New York back home on the same day? How much can I visit the U.S. on a B-2 visa?